Good wicking material is an essential ingredient for any build. Without it, the most complex dual coil build will fall far short of your expectations. Thankfully, cotton wick is easy to find, and relatively cheap. Today, we will take a look at the newest version of Cotton Bacon Prime. Purchase Cotton Bacon Prime here. I’ve always been a big fan of Cotton Bacon’s branding — it’s clean, simple, and easy to read. You know exactly what you’re getting, even if you’re a new vaper who’s trying cotton bacon for the very first time. The price of $6.99 is reasonable as well, especially considering the amount of wicking material you’re receiving. Perhaps texture isn’t as important as other factors to builders. For me, it’s a big deal. If the cotton falls apart too easily, or is too stringy, that’s a pretty solid sign that you’re wicking material isn’t going to last as long as you’d like it to. The 4″ pieces of Cotton Bacon Prime were really dense and it took some effort to tear and conform a suitable bit of wick for my 3″ ID Aliens. This difference in construction didn’t alter my wicking process overall. I noticed immediately the improved absorption characteristics of Prime, after wicking a dual Alien build and per-saturating the cotton. It took quite a few extra drops of vape juice to completely soak the cotton, before throwing my top cap on and taking my first vape. This same improvement directly translated to e-juice required for dripping while vaping, it took 2-3 more drops on of e-juice (70/30) on each coil, before continuing. I’ve tried a variety of cotton manufacturer’s over the past 4-6 years, but trust me when I say, the quality of Wick N’ Vape products remains one of the best for vaping. The flavor and cloud production, on both single and dual coil builds, surpassed my expectations. I never noticed a starchy or ‘cardboard’ like aftertaste post vape, and the cloud production on a single Framed Staple was enough to impress anyone. This is a big one for any vaper, builder or not. Especially with the high sugar vape juices on the market today, the tougher the wick, the better. 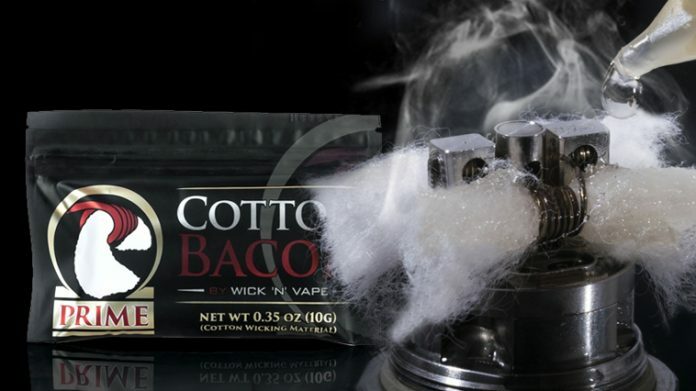 Using a dual build wicked with Cotton Bacon Prime, vaped at 50-70 watts for 2-3 hours at a time, my cotton held up until the very end. When it was time to re-wick, the appearance of the cotton was white and slightly translucent, very impressive! Not only will cotton last longer in each build, but a single bag of cotton will outlast any bag of organic sheets you may have! V3 (prime) earns an A+ here. If you’ve never tried Wick N’ Vape products before, I’d seriously suggest starting with Prime. When compared to previous versions, or even completely different brands, this cotton will surely impress most vapers. Organic sheets of cotton simply cannot compete with the ease of use, absorption, flavor, and cloud production of the Cotton Bacon lineup. And for a product that retails for a few bucks more than your traditional sheets of organic wick ($6.99), there’s virtually nothing holding you back from trying a bag yourself!